Harrogate Railway endured another difficult afternoon when they were thrashed 10-1 by Ryhope Colliery Welfare in the first round proper of the FA Vase. 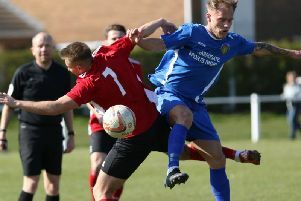 Liam Gray’s men went into the clash with their Northern League Division One opponents having lost nine of their previous 10 games, their one victory in that time being a 1-0 success over Willington in the previous round of the competition. The match should have served as a welcome distraction from a difficult NCEL Premier Division campaign that has seen the Railwaymen slip to second-from-bottom of the table, but the result only brings more misery for a side that has conceded 20 goals across three fixtures in the space of seven days. The visitors didn’t make the best of starts to Saturday’s clash and went behind with just 10 minutes on the clock, Kyle Davis firing home from the penalty spot after Ryan Basi was adjudged to have handled the ball. James Ellis doubled the home lead in the 27th minute and then added another goal just 60 seconds later with a low strike from outside the box. Ten minutes before half-time the game seemed all but over at 4-0, Josh Holme-Jackson flicking home a Davis cross. The Rail did managed to pull one back just before the interval when Mick O’Connell’s ball into the box afforded Albert Ibrahimi the opportunity to shoot past Jonny Ball in the Ryhope goal. That was as good as it got for the Starbeck club, however, and the hosts would have restored their four-goal advantage before half-time but for Shane Hamilton’s goal-line clearance. It did only take Ryhope three second-half minutes to register number five though, Holme-Jackson left with time and space to finish past James Webster following Davis’ through-ball. Moments later, Ellis completed his hat-trick with a left-footed strike from just inside the area, moving the scoreline along to 6-1. Holme-Jackson then wrapped up his own treble courtesy of a 67th-minute diving header, adding a fourth of the afternoon shortly afterwards, once again with his head. David Gordon got forward from defence to smash in Ryhope’s ninth goal in the 79th minute and opposite full-back Corey Nicholson then rounded things off after advancing down the right and sending over a cross that ended up in the back of the net. Next up for the Railwaymen is a daunting home clash with title-chasing Pickering Town at Station View on Wednesday evening, 7.45pm kick-off.